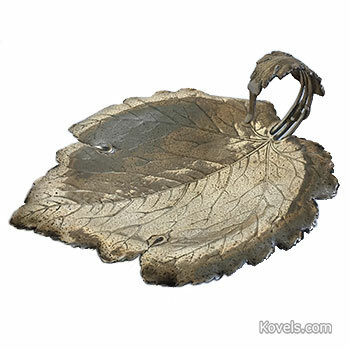 Kovels I am sorry but you are incorrect about one detail concerning this silver grape leaf dish. The grape shears would hang from the handle when they were not in use. The grapes may have hung on it temporarily while being snipped but when displayed and not being used, the actual grape shears would hang from the handle. It's a silver-plated dish for serving grapes. Dish is leaf-shaped with vine handle; hang the grapes on the handle and snip a portion with grape shears. I have something like this. Mine is made out of iron and is quite heavy. It's not at all attractive as is this one. It''s blackish. I'd love to know what it is used for.